I don’t know how it took me this long to write a post about Ramban. He happens to be my personal favorite Biblical commentator, because his Hebrew writing is so clear and expressive. When studying his commentary in high school, I got a huge kick out of the fact that he would quote Rashi–Rabbi Shlomo Yitzchaki of 11th-century Provence, the spiritual father of all Biblical and Talmudic commentary–and then just say “אינו נכון” (“This is incorrect”). About Rashi. That’s like a college freshman standing up in the middle of a lecture by a senior professor at university and saying, “That’s wrong.” What a badass, I thought. 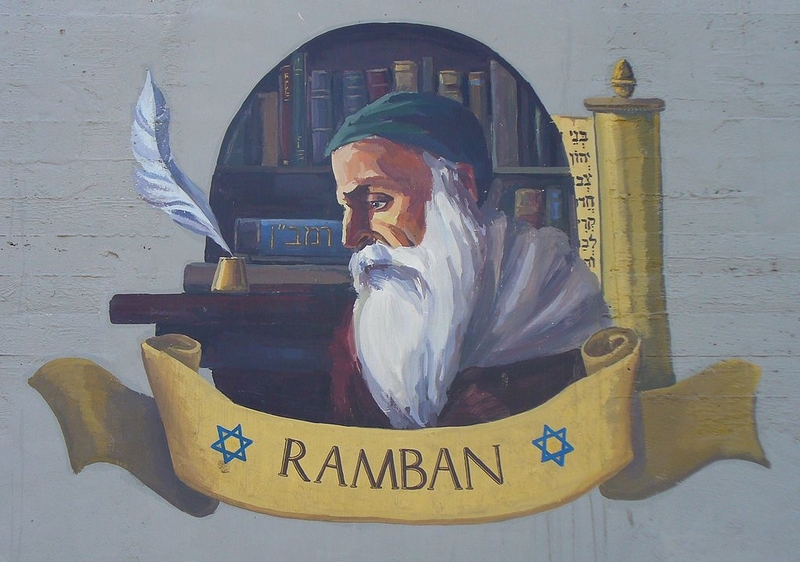 “Ramban” is a Hebrew acronym of his name, which was Rabbi Moshe ben (son of) Nachman. But guess what? He had a Catalan name, too: Bonastruc ça Porta. That’s right: he was born in Girona in 1194, and lived there for most of his life. He is also known as “Moshe ben Nachman Gerondi”–Moses, son of Nachman the Gironan. Ramban was a central feature of the Golden Age of Sepharad. He was 8 years old when Maimonides died, and Rabbenu Yonah (Jonah Gerondi), a rabbi and moralist most famously known for his ethical work Sha’arei Teshuva (“The Gates of Repentance”), was his cousin. He began his writings on Jewish law at age 16, and soon emerged as a prominent Jewish scholar, eventually being named rabbi of Girona and later, chief rabbi of Catalonia. He was also a doctor, like many other famous Jewish scholars of that age, and aside from the aforementioned Biblical commentary, wrote a number of notable works on Jewish law and philosophy. He seems to have lived most of his years in relative peace–until the event in 1263 that turned his life upside down and secured him a place of honor in the Jewish Hall of Badassery. Most of what I know about the Disputation I learned from a thorough article on the topic by Rabbi Berel Wein, a well-known Jewish historian, called Ecumenicism and Dialogue 1263 C.E.. I also consulted Ramban’s own account of the debate, Vikuach HaRamban (“The Ramban’s Disputation”), in the original Hebrew. The debate was initiated–as it often is–by a Jewish convert to Christianity (seriously, we are almost always our own worst enemies) who took the name Pablo Cristiani upon conversion. Cristiani convinced King Jaume I of Aragon to order a public debate between himself and the chief rabbi of Catalonia. The king summoned Ramban to Barcelona for a dialogue that began on the 20th of July, 1263, and continued through four debating sessions, the last of which concluded on July 31st. Rabbi Wein points out that open interfaith dialogue is a fairly recent phenomenon. During the Middle Ages, the Church got into the habit of holding such public “debates” for the usual reason: to discredit Judaism and persuade more Jews to convert to Christianity. In most cases, it was a bit of a kangaroo court, because whatever poor rabbi was summoned to defend Judaism in these debates was never actually permitted to speak freely. I wonder why the Christian side always won! Yeah. He actually said that. To the face of James I the Conqueror. The Dominican priests claimed victory, and Ramban felt obliged to publish his account of the debate to let the public decide who had won. The Dominicans didn’t even try to refute his account–they accused him of blasphemy instead. King Jaume, mistrusting the Dominican court, called a special commission and ordered that the proceedings be conducted in his presence. Ramban’s defense argued that though he had indeed spoken out against Christianity, he had been granted permission to say all these things by the king himself. The king recognized that his case was just, but felt obliged to do something do calm down the Dominicans, so he sentenced Ramban to two years’ exile. The Dominicans felt that this wasn’t enough and appealed to the Pope, who expanded the punishment to permanent banishment. Ramban’s reestablished community was the beginning of a 700-year continuous Jewish presence in the Old City of Jerusalem, all the way up until the War of Independence in 1948, when it fell to Jordan. It was in Jerusalem that Ramban wrote his magnum opus: his Biblical commentary. He also maintained a correspondence with his family and community in Sepharad, trying to create a stronger connection between the Jewish communities of Judea and Spain. He died after three years in the Holy Land at the age of 76. If you want to read Rabbi Wein’s full article about the Disputation that summarizes the main points of the debate, you can find it online here; it was published in a collection of essays of Jewish responses to missionaries called The Real Messiah? (and if that sounds familiar, that’s because it’s mentioned in By Light of Hidden Candles!). Speaking of awesome Catalans (albeit not Jewish ones), I am still following your news carefully and waiting with bated breath to see what happens next… and for those of our readers who have missed them, I’ve written three Josep-approved op-ed pieces for The Times of Israel on Catalan independence, which you can read here. This post is #3 in my Awesome Jews of History series, the previous two being portraits of King David and Don Isaac Abravanel. Are there any awesome Jews of history you’d like me to write about? Let me know!